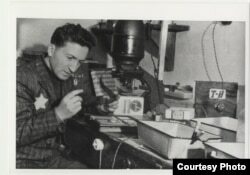 Israel has opened a unique exhibition of Holocaust images to help people understand the contrasting motivations of photographers who documented the genocide, some nobly and others callously. Organizers at Yad Vashem, Israel's official Holocaust memorial, say one of their goals is to show how some photographers manipulated the images for malign purposes — a practice that continues in the contemporary world. The Holocaust was the persecution and killings of 6 million Jews and other minorities by Nazi Germany and its allies in World War II. Yad Vashem's "Flashes of Memory: Photography During the Holocaust" exhibition opened in January and will run throughout the year. It challenges visitors to think about who created the 1,500 photos on display, and why. The photos are divided into three main groups: those taken by Nazis and other Germans; those taken by Jewish victims of the Nazis; and those taken by Allied forces who liberated Nazi death camps. The exhibition highlights the perspectives of the Jewish photographers who sought to memorialize the suffering of their people in the ghettos. ​It emphasizes the photography of U.S. and other Allied soldiers who wanted to reveal the horrors of the Holocaust to the world, and to gather evidence for war crimes tribunals. Photo of U.S. officer in front of bodies of prisoners in the Dachau concentration camp after liberation, displayed at Yad Vashem's "Flashes of Memory" exhibition in Jerusalem, Jan. 24, 2018. The exhibition also explains how Nazi photographers and photo editors portrayed Jews as a racially inferior people in order to popularize anti-Semitism. Nazi photo of Jewish boy surrendering as Nazi troops force Jews out of the Warsaw ghetto in April 1943, displayed at Yad Vashem's "Flashes of Memory" exhibition in Jerusalem, January 24, 2018. 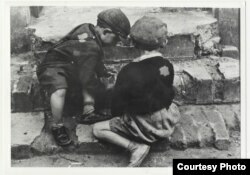 In an interview with VOA's Persian service at a press preview of the exhibition, Yad Vashem Chairman Avner Shalev said it is designed to show people a different way of looking at Holocaust photographs. Hundreds copies of photographs of Jewish life under Nazi persecution, scattered on a lighted table at Yad Vashem's "Flashes of Memory" exhibition in Jerusalem, January 24, 2018. "[We want them] to think and follow the eye of the photographer," Shalev said. "But what is more important sometimes, [is to enter] the mind of the editor, who is manipulating, and doing whatever he needs and wants, according to his ideology, with the photograph." Iran is one country whose leaders have drawn international criticism in recent years for manipulating Holocaust imagery either to downplay its significance or call it a myth. Iranian Supreme Leader Ayatollah Ali Khamenei posted a video on his website in 2016, in which he said it was not clear whether the "core" of the Holocaust was a reality, as he showed pictures of Holocaust deniers whom he argued had been persecuted in the West. Under Khamenei's leadership, government-affiliated groups also have held several exhibitions of Holocaust cartoons satirizing the genocide. The latest exhibition, held in Tehran in May 2016, featured international submissions and an award ceremony for winners who received bronze statuettes. Shalev said he believes such images are unlikely to seduce the Iranian people. "At the end of the day, the truth will prevail," he said. "In the long run, they have to look at the material with a very examining [eye] and think about the layers of the presentations." Yad Vashem hopes people also will look at its presentations of Holocaust images in "Flashes of Memory" to understand how Nazis harnessed the power of photography to persecute and ultimately slaughter millions of Jews.